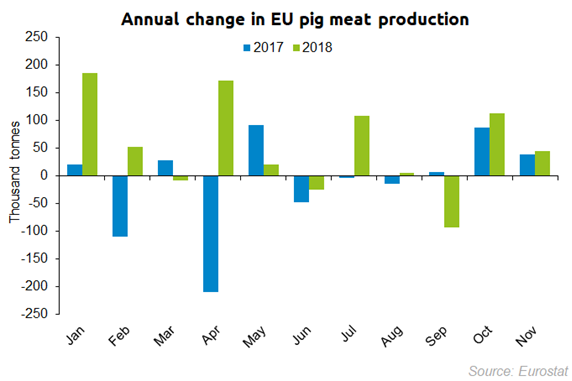 EU pig meat production rose 2% year-on-year in November to total just under 2.1 million tonnes, according to the latest figures published by Eurostat. Increased production was driven by an increase in slaughterings, which were also up 2% year-on-year to total 22.7m head. Average carcase weights for across the bloc were therefore relatively unchanged at 92.4kg. Tom Forshaw, an analyst at AHDB Pork, said: “Increased production towards the end of 2018 kept prices low, although there’s been no further downward pressure on the EU reference price since November. So, it seems supply and demand have been fairly balanced. The Eurostat figures revealed that a number of countries contributed to the rise in production in November. Most notably Denmark, where production was up 29% (+32,000 tonnes) year-on-year to total 141,000 tonnes, though this may be influenced by differences in reporting periods between the two years. Mr Forshaw added: “Germany also increased production by 21,000 tonnes (+5%). Meanwhile, Spain (+1,900 tonnes) made more modest increases in production. Interestingly, as the average carcase weight increased, Polish production in November increased by 2% (+3,700 tonnes) while slaughterings actually declined by 29,000 head (-1%). This may have been influenced by a drop in demand from processors in late October, after a temporary embargo was placed on Polish pork products by the US.